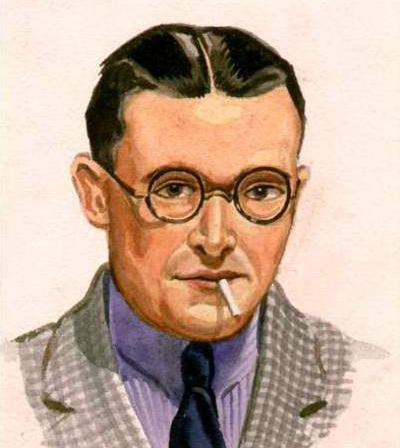 Hanging proudly or languishing in darker recesses, Joe's paintings are still the subject of great interest over forty years after his death as is evident from the response to the web site established from his extensive records. One of four brothers and two sisters Joe was forever drawing in and around the family Tannery in Appleyard Lane, Armley. 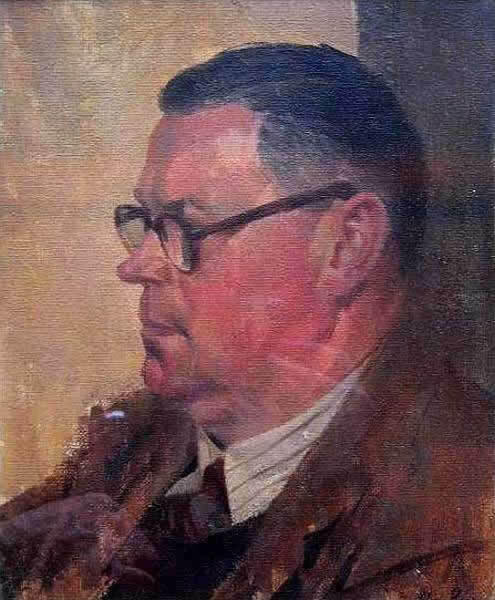 Upon leaving school he attended local evening classes at Leeds School of Art where his fondness of animals gave rise to his interest in Romany and Circus life.Gaining a job in window display and general advertising Joe's painting was limited to weekends and weekday evenings putting down the scenes he was beginning to love and know so well, Airedale, Wharfedale and Washburn Valleys. 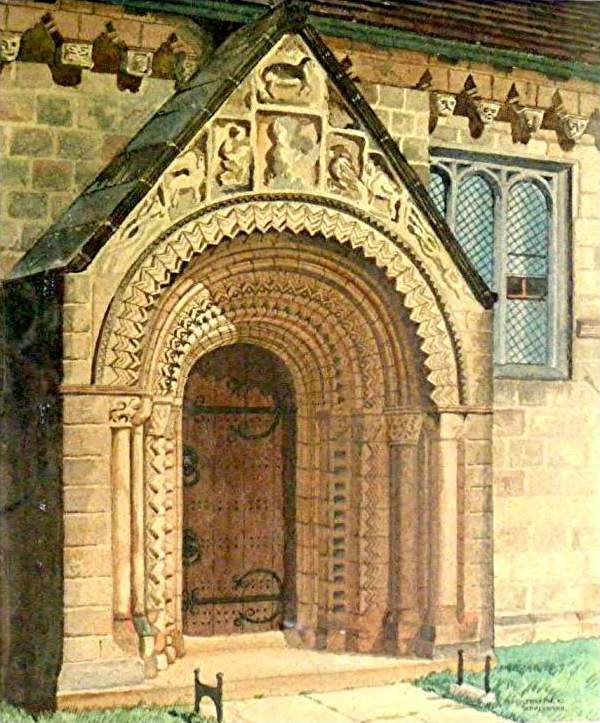 His first exhibited painting, an architectural study of Adel Church Porch, one of two hundred at The Yorkshire Artist's Exhibition at Leeds City Art Gallery, in 1934, was something to his credit. Horses and figures soon became evident with the Spring Exhibition at Bradford - two entered - two accepted! One of them "Morning Exercise on Greenhow Hill" had according to Joe horses with giraffe-like necks! 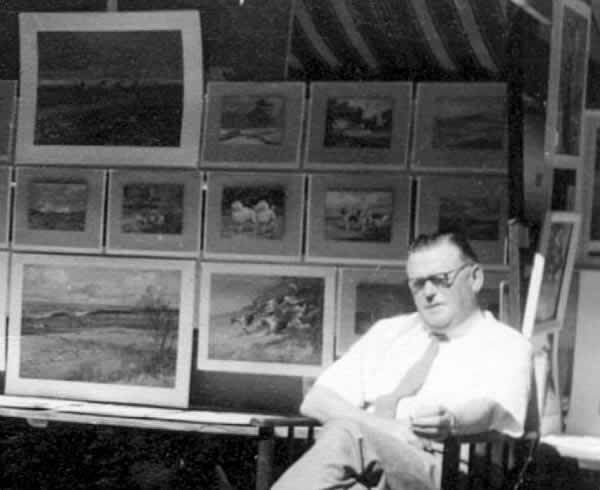 "Buckden" his first sale, in March 1935 at the Cartwright Memorial Hall Annual Spring Exhibition, was sandwiched between an Epstein drawing and a Henry Rushburn, which filled Joe with more pride than the two-guinea sale fee. 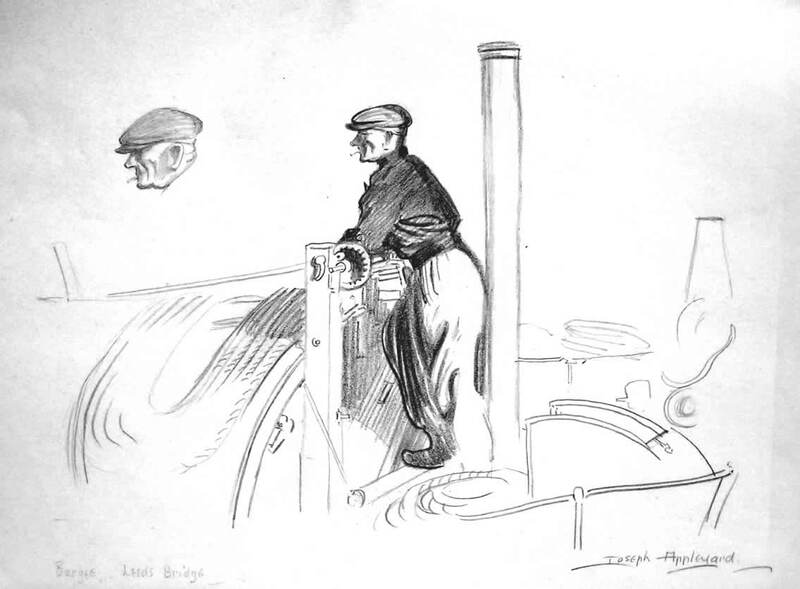 Frequent visits to "Whitelock's" in Leeds welded his friendship with fellow artist Jacob Kramer, a forthright critic, whose kindness and comments encouraged Joe. Still longing to be able to paint what pleased him, one August morning, he gave his notice, collected his cards and that was that! 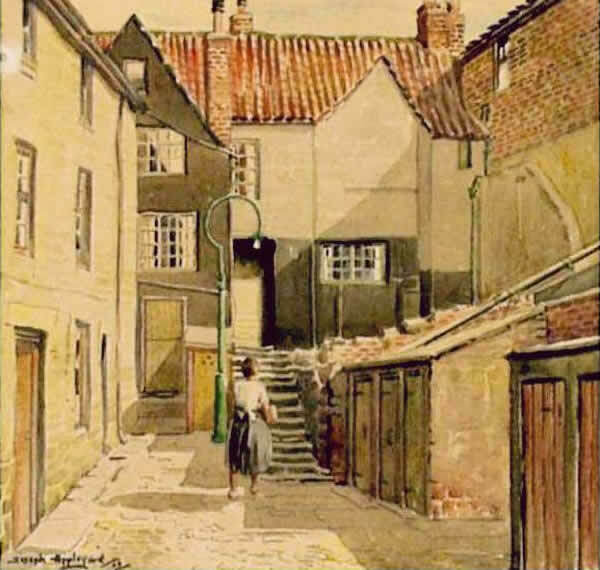 His parents realising that he was happier on his own, encouraged him to sketch and paint in the country, the back streets of Leeds and the canal side. 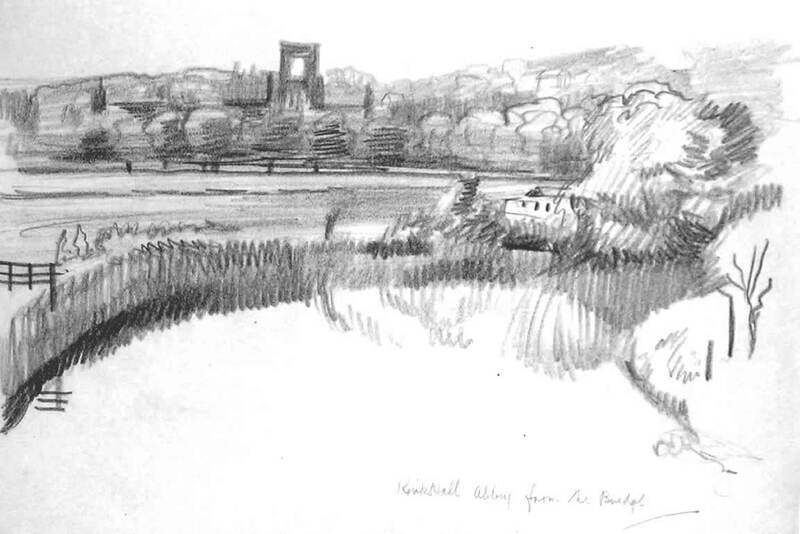 Kirkstall Abbey and Temple Newsam became his favourite haunts. Jacob recommended he approach the Yorkshire Post who gave him space of three columns width by 6" deep each Saturday in their Weekly Edition. 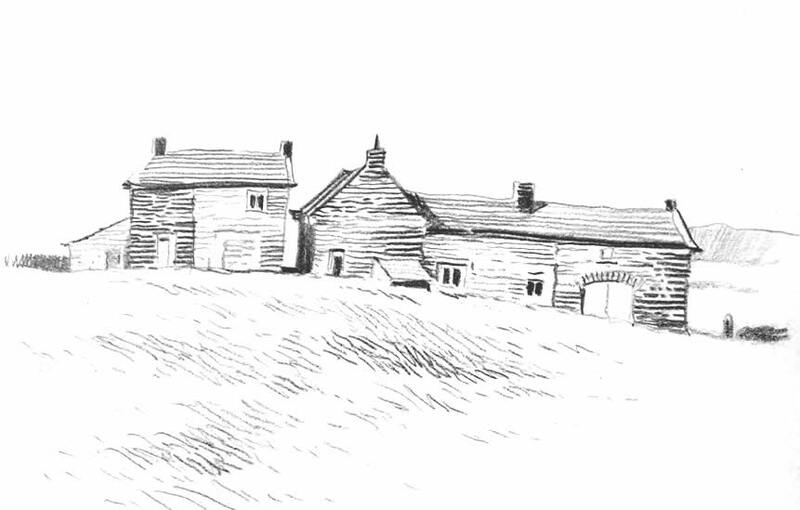 This small contract proved to be his salvation for regular pay gave him a free hand to draw in black and white any subject with a Yorkshire accent. 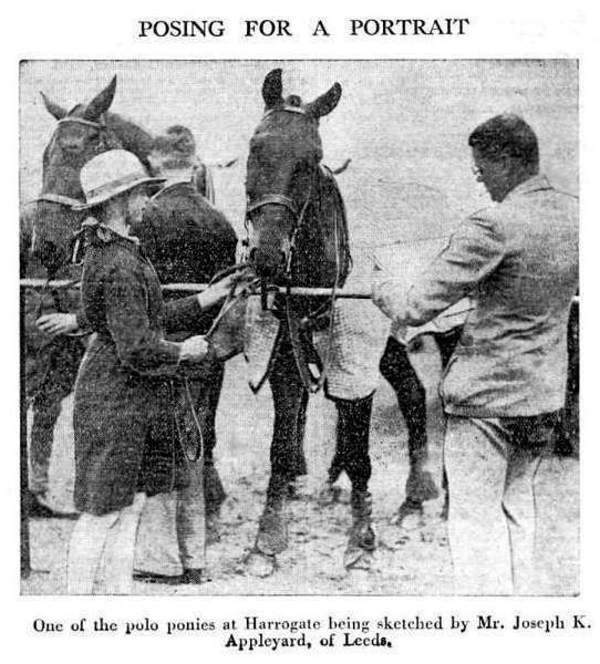 His first assignment - Polo on the Stray at Harrogate - proved horses would play a big part in his career. 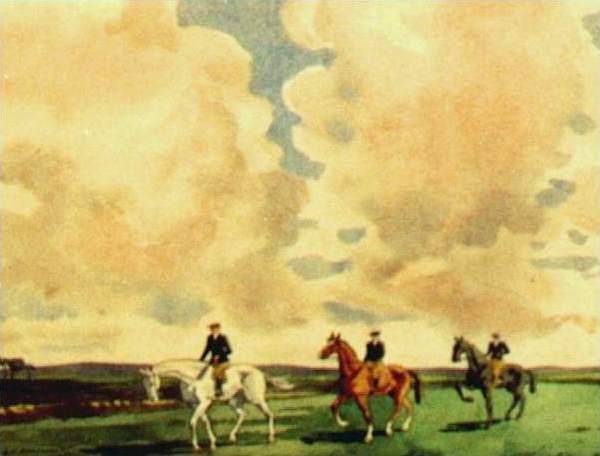 Conspicuous at his easel a Polo player asked Joe to paint two polo ponies and accepting the fee of two guineas Lord Barnby thrust his card into Joe's hand. This very event captured for posterity! 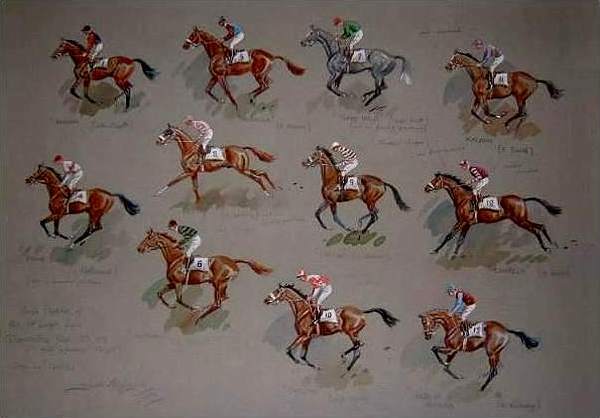 Another commission came the next day when a lady said it was her pony featured in the photograph and with a series of Polo players on his easel, asked for a similar sheet of the Ladies match. Lady Margaret Drummond-Hey, a keen polo player, ultimately featured in the page of sketches. On his second assignment, Woodhouse Feast, he was spotted by Jim Corrigan sketching his roundabout and asked if he could buy a sketch. The sketch was published and the drawing he did for Jim was delivered on the Friday. Many more assignments followed - all making good material for his pencil. 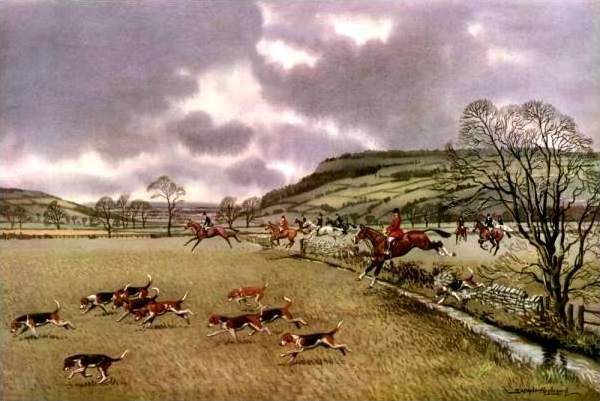 One Friday afternoon a chance opportunity arose in the reporter's room, saying more in fun than anything, "Take your pick, any sketch ten shillings," a young man, putting aside those with horses, asked "Will you accept £10 for the three?". 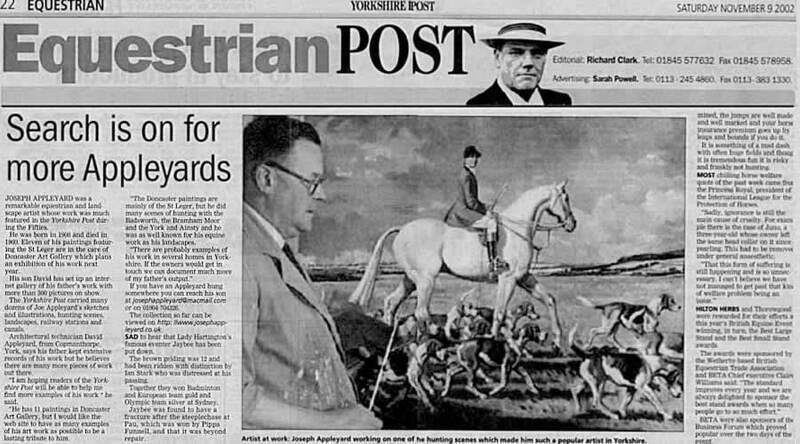 David Astor, had come to the "Yorkshire Post" to increase his knowledge of newspaper work and seeing more of Joe's work suggested he did the black and white drawings for a series of Yorkshire Professional Huntsman Biographies. 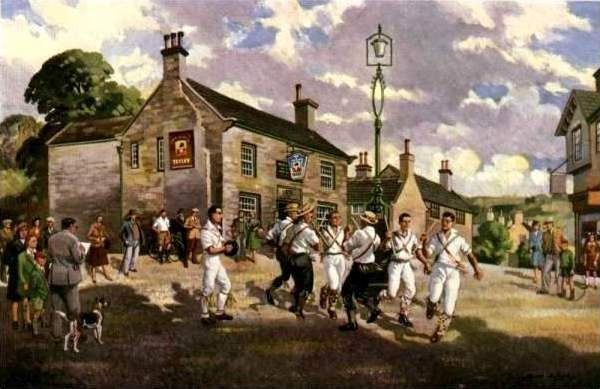 Their first biography was Charles Littleworth of the York and Ainsty. 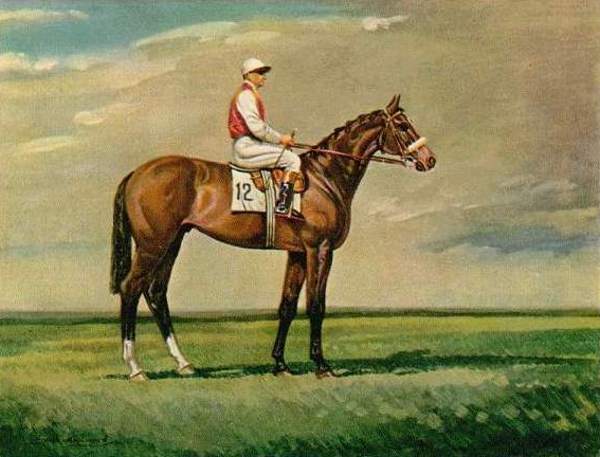 In 1937, he showed a portrait sketch of "Golden Miller", Miss Dorothy Padgett's champion chaser, at the Bradford Spring Exhibition. 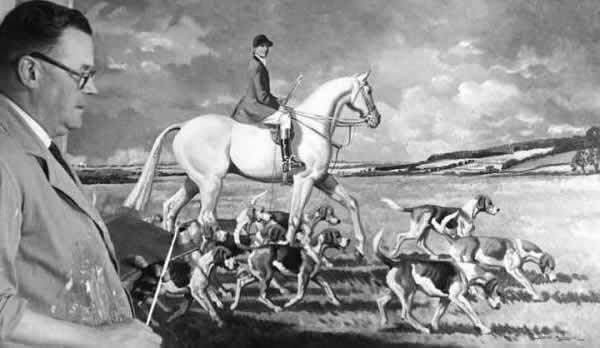 Later that year, he took a studio at Kennels Farm, Knayton Moor, situated at the foot of Boultby Bank where Tom and Madge Fletcher and their only son, Jimmy soon convinced Joe his hounds were much better than his horses. 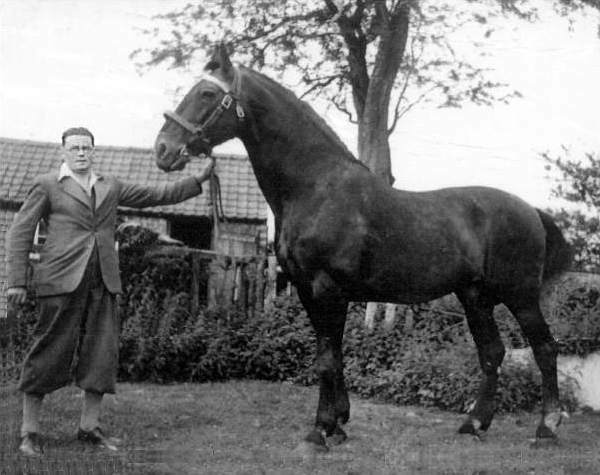 With Tom's horses forever at his disposal he had Tom to thank for his advancement in horse portraiture. 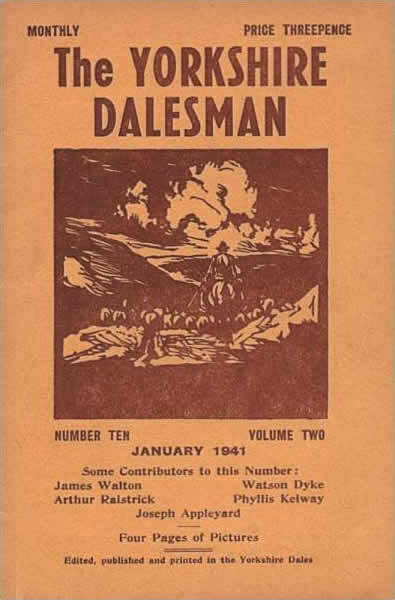 It was all good fun and he enjoyed every minute of his stay there undertaking an ambitious sketching tour, which was published in the Dalesman in May 1938. Almost blind in his left eye, the war saw Joe drafted into the Pioneer Corps, rising to Corporal in his five-year service. 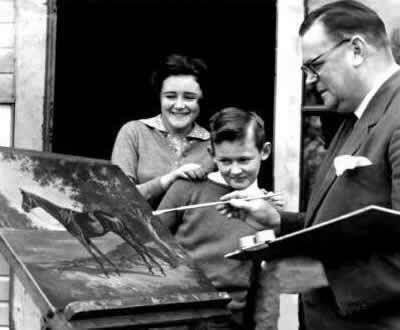 He married Enid in March 1940 and took every opportunity to travel back to his Leeds studio from his postings in Bradford and Carlisle. 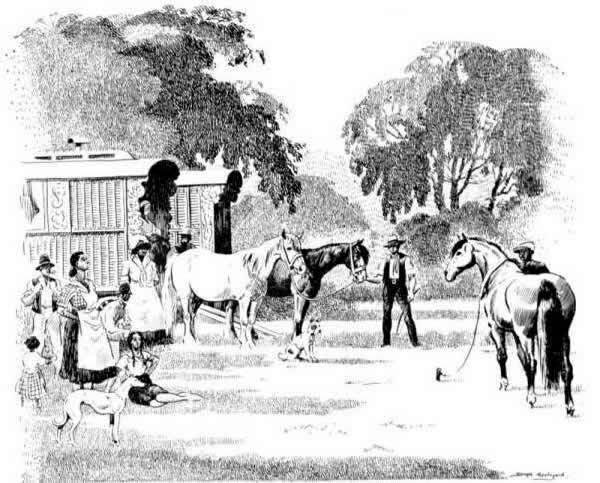 Still finding time to travel with Bertram Mills and Fossett's Circus's, attend horse fairs, follow hunts, undertake commissions and exhibit his normal subjects on a regular basis in the West Riding, one sale, according to the Sunday Times of 1941, "gave a vivid glimpse of an Army Boxing Tournament". 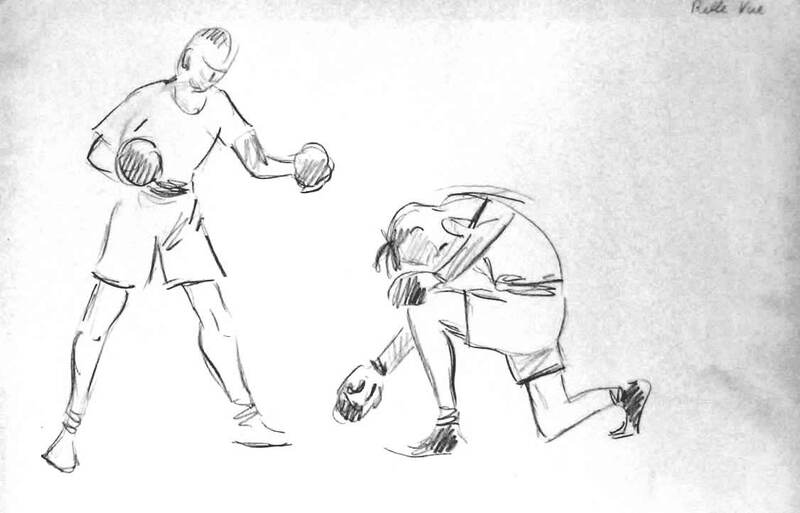 His wartime sketchbooks particularly reflect barrack life and characters. 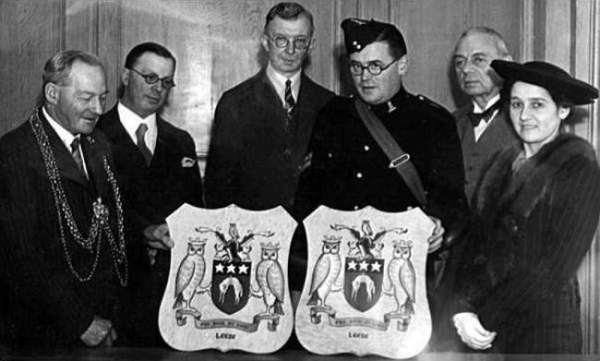 He designed the Corps own Christmas card for 1941 and painted two shields bearing the Leeds Coat of Arms for the officer's and men's quarters of the ex US destroyer HMS Leeds. His lion studies particularly impressed at his one-man show at the Bradford Civic Playhouse Cafe in 1942. He regularly compered Army concert parties, performed as a cartoonist and was Santa at Christmas parties for the soldier's children. 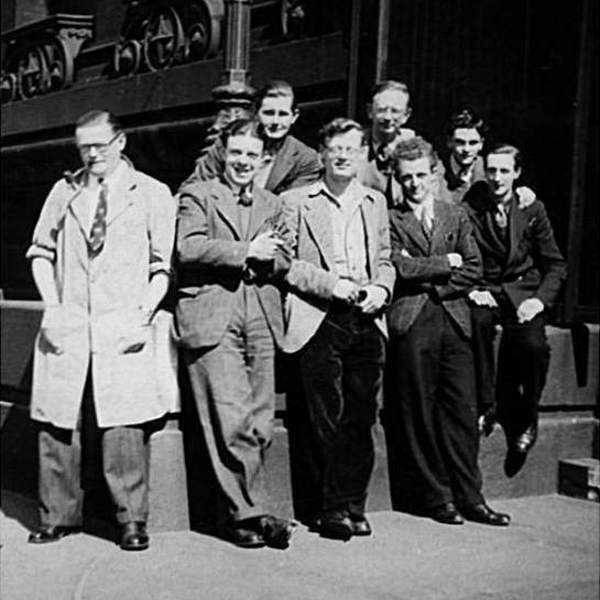 Hardship followed the war so Joe delivered newspapers and groceries to supplement his income and allow time to attend Leeds Art College where he later became a part time tutor, to amongst others, Frankie Vaughan. Does anybody know any of the students? 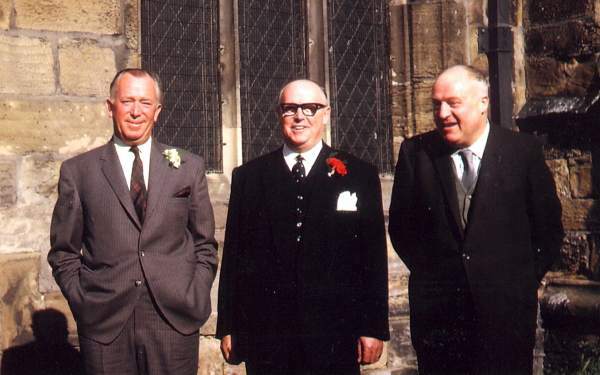 With the birth of his daughter, Joyce, in 1945 and myself in 1948 he took further part time tutoring work at the Swarthmore Adult Education Centre and Leeds College of Bakery, where he taught cake decoration and design. From his Headingley studio, the front room of our first floor, two storey flat, Joe did not waste much time during these years, celebrating his return to civilian life with a one-man show at the Leeds Fine Arts Centre in February 1946. 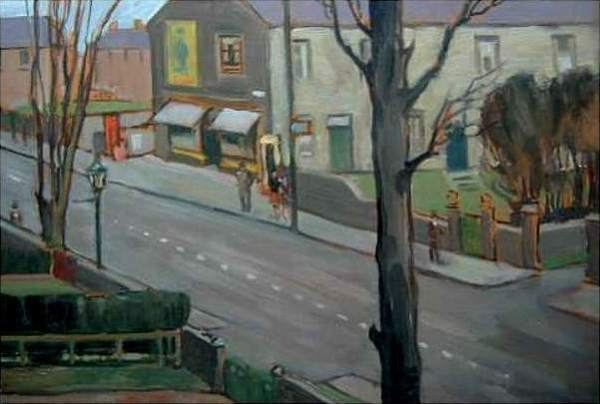 This is Joe's view from his Headingley Studio in the mid 50's - no tram lines by then! There is still a horse trough on the roadside today! This painting was recently auctioned by the family and is now in America. 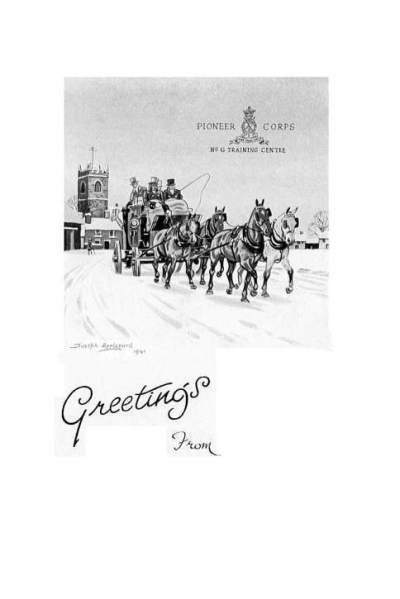 He wrote and illustrated "Riding through the Ridings", an account of coaching days along the Great North Road, from Doncaster to Scotch Corner, though still unpublished, can now be enjoyed on this web site. 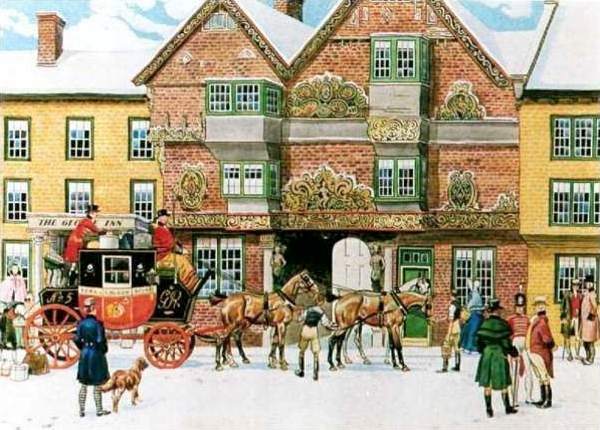 The George Inn, York featured in "Riding through the Ridings"
By the end of 1947 he had exhibited over two hundred different works. 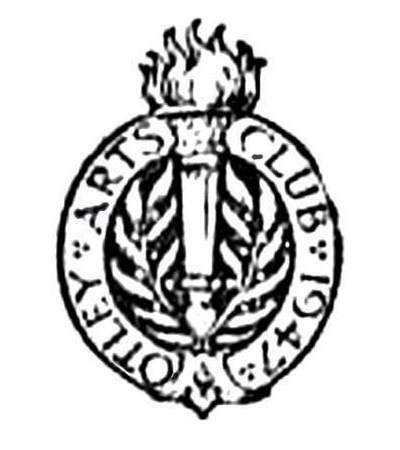 He co-founded Otley Arts Club with, amongst others, Janet Rawlins' father, Eddie. 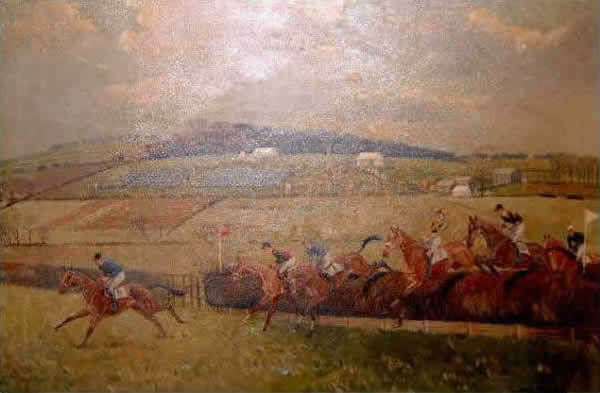 Undertaking many commissions, including portraits of "Dante", "Diredawa", "Airborne" and "Steady Aim, one of Joe's more unusual commissions was for a painting of a marbles tournament between Lady Docker and a number of Yorkshire sporting notabilities in aid of Cancer Research. 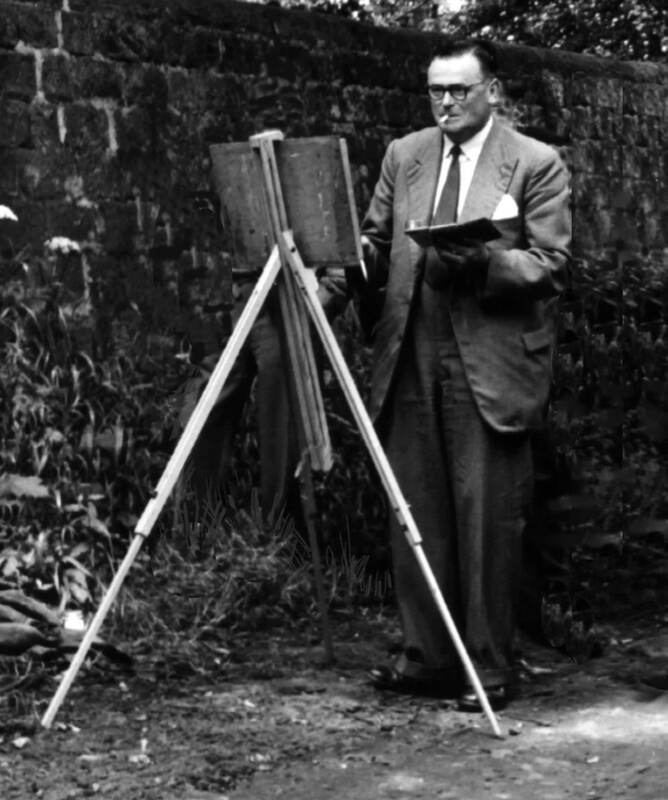 I believe his most prolific year was 1953 when seemed to produce many large oil paintings. 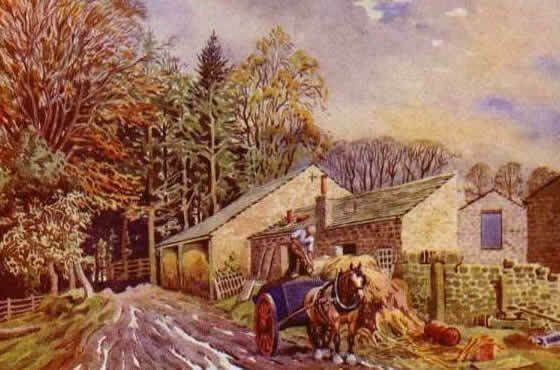 On the strength of this newspaper photograph a reader of the Yorkshire Post purchased this painting without seeing it first hand. 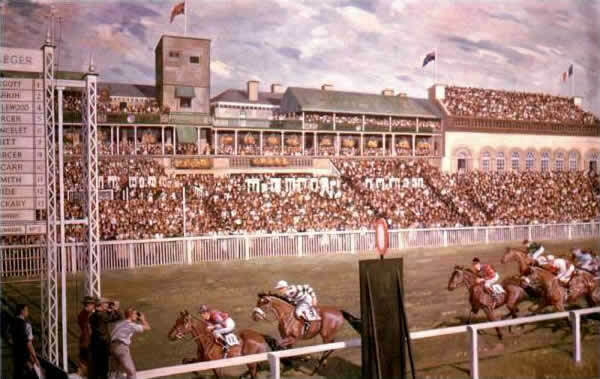 It sold for 75 guineas in 1954 and was auctioned in 1987 for £1,050. 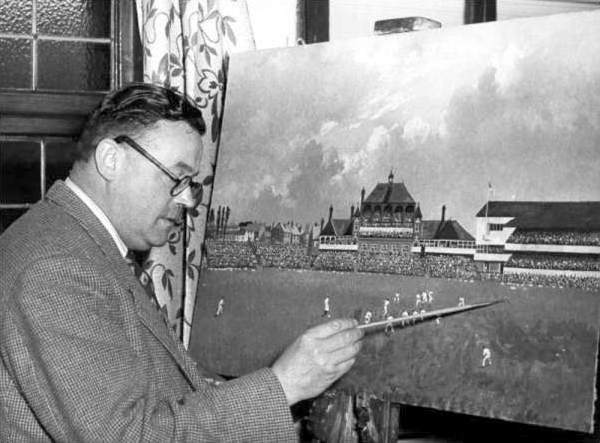 Joe, an active Rotarian, became the "eyes" for the blind at Headingley, when he commentated for a small group of blind people. 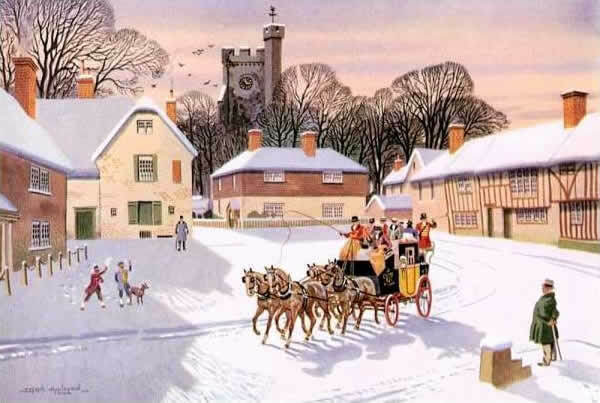 Toffee tins, jigsaws, playing cards, menus, pub signs, sauce labels and numerous Fine Art Publications represented his commercial work along with a regular commission from "Holly Leaves", the Christmas Edition of Sport and Country, funding our holidays - days away. The 1955 cover of "Holly Leaves" the Christmas Edition of "Sport and Country"
These days away were agricultural shows, walking in the dales, delivering to galleries, beagling, hunting and sometimes polo, always returning home in the evening to teach or paint. Not so at the weekend, those evenings were dedicated to the family. A Subbuteo pitch - finger tipped table top football to the uninitiated - was lovingly painted on the back of my favourite picture, which I had the good fortune to see a few years ago and is featured on the front of Joe's Home page, although the pitch had been permanently protected by hardboard, covering our handiwork! 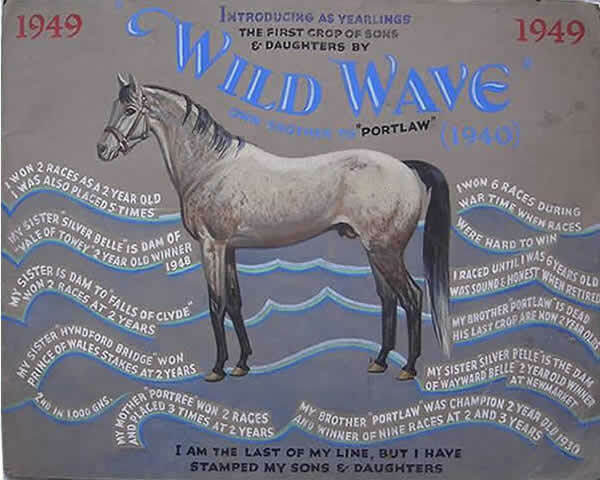 Joe was a member of numerous Arts Clubs and Societies and established his reputation further afield when he was invited to show alongside Sir Alfred Munnings and Lionel Edwards at a Broadway Gallery in 1955. 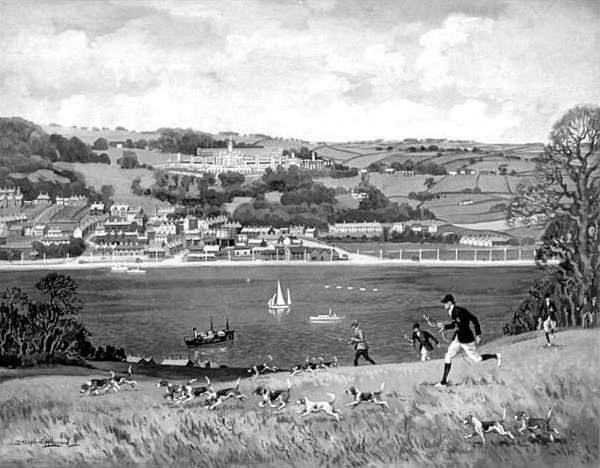 He was also invited to paint the beagle packs maintained and hunted by the students and cadets of Eton College and the Royal Naval College, Dartmouth. 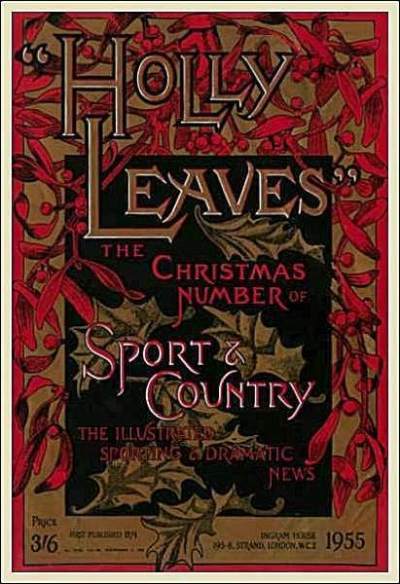 appeared in the 1953 issue of "Holly Leaves"
Technology eventually arrived, in 1958, when we moved to Cookridge and a telephone was installed - still no TV. The wooden summerhouse studio caused quite a stir when the doors faced away from the road to make our "garage" appear back to front. The lack of car never deterred Joe from traveling to commissions, flying to the most distant one in Ireland. 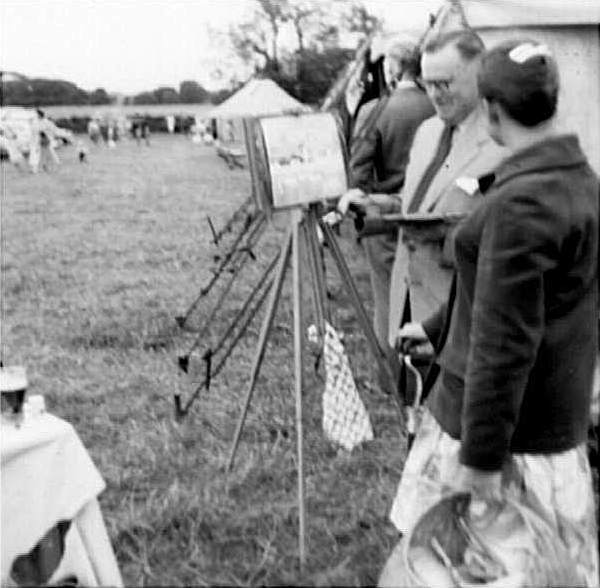 Joe's astute marketing gained many commissions and lucrative contacts from his regular exhibition stand at Harewood Horse Trials. These were some of our favourite "days away" and only eight miles from our doorstep. It had all the pageantry of the military, show jumping, horse trials and country fayre. 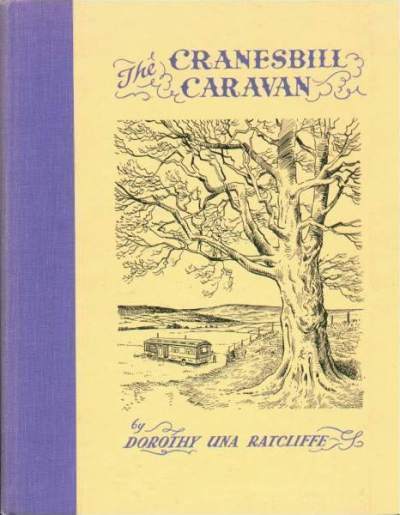 Probably his most ambitious project was to illustrate "The Cranesbill Caravan" for Dorothy Una Ratcliffe. 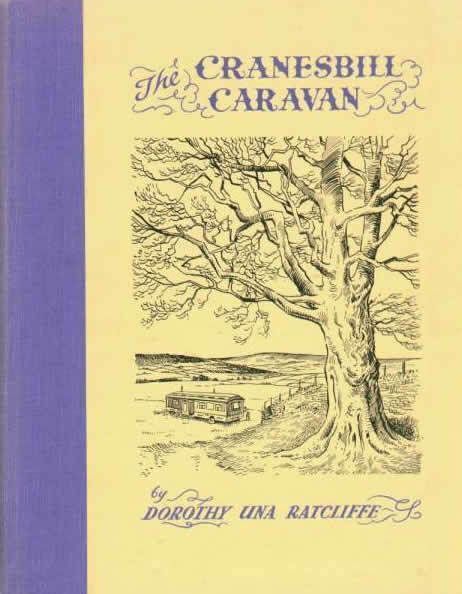 The cover for "The Cranesbill Caravan"
To commemorate the Golden Jubilee of the Doncaster Museum and Art Gallery, Joe was commissioned to paint the 1959 St. Leger, which is in their collection with another ten of his paintings. 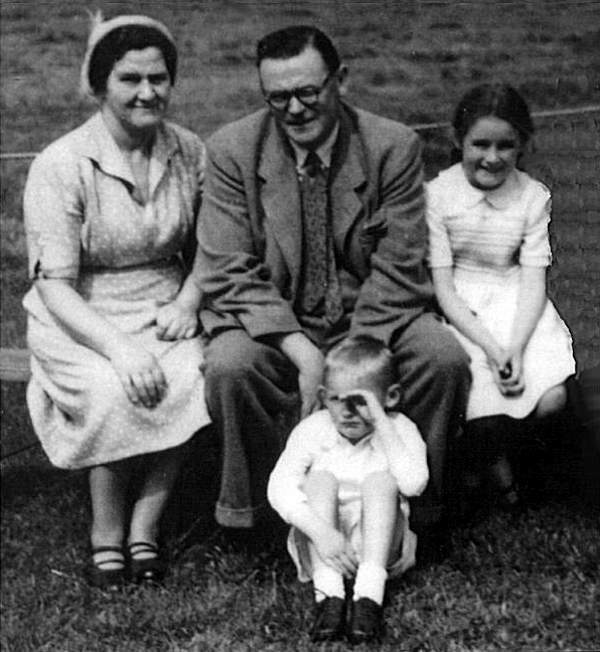 Thursday 15th September 1960 was not a date for our family to forget. I vividly remember my Uncle Ralph standing below me on the back door steps. He didn't need to say anything. 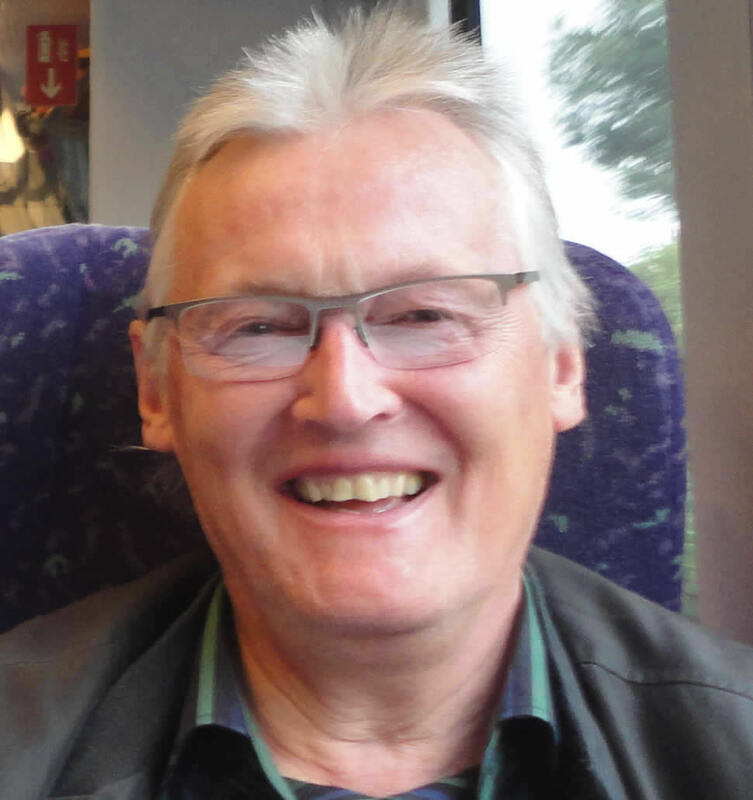 Joe was killed when he fell from a bus at Lawnswood roundabout on his way to Kettlewell. Eric Taylor, principal of Leeds College of Art, made this fitting tribute. 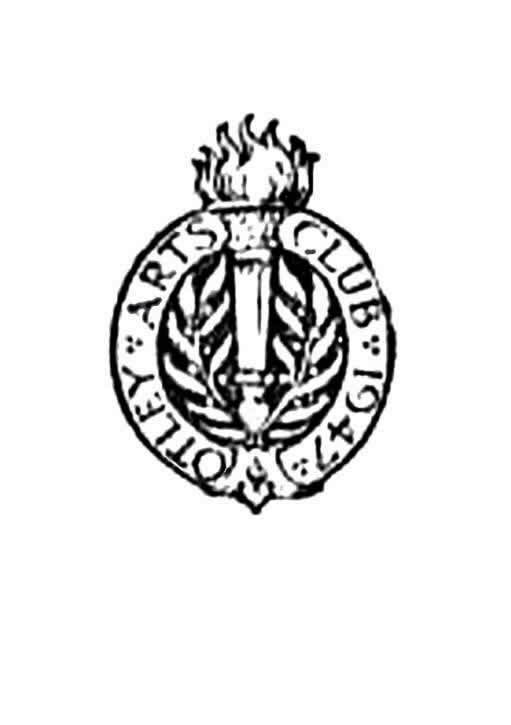 "There will be so many people who mourn the loss of Joe Appleyard that on behalf of all his artist and teacher friends in Yorkshire I would like to pay a tribute to his greatness. We all knew him as Joe, for above all he was a straight forward, kindly man and a friend to everyone. 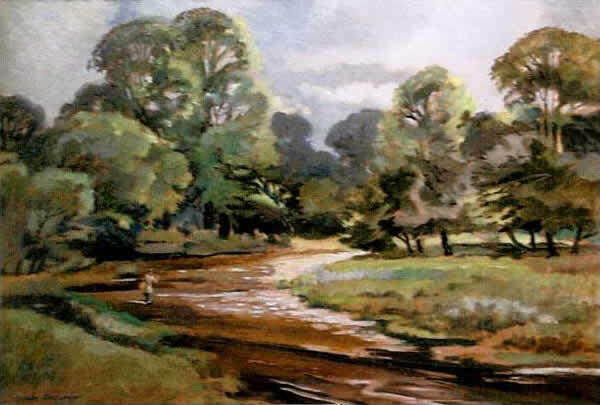 His paintings, too, were clear, straightforward expressions of the horses and the countryside he loved so much. 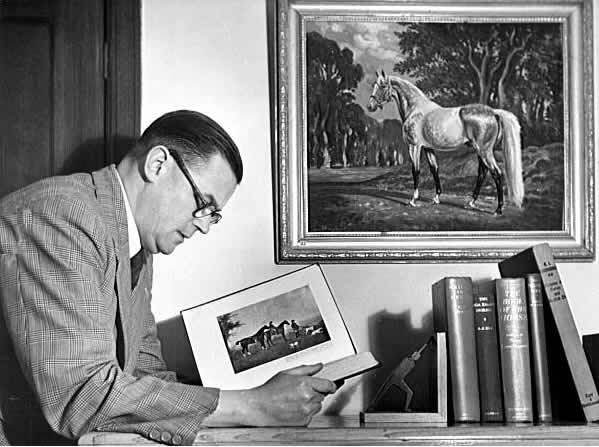 He developed a name for himself in a comparatively short time for his excellent horse portraits. Joe was an entirely loveable character who will be missed greatly not only in Yorkshire but also in the length and breadth of England. 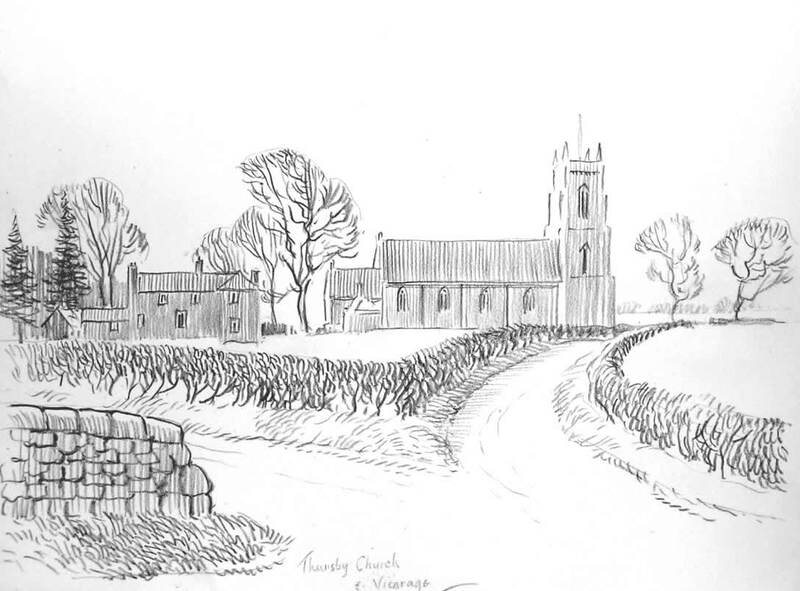 He will be missed in many of the great houses, as well as the small cottages and his great abilities have, I know added much to the happiness of students and friends of all ages in the schools and art clubs in Yorkshire." 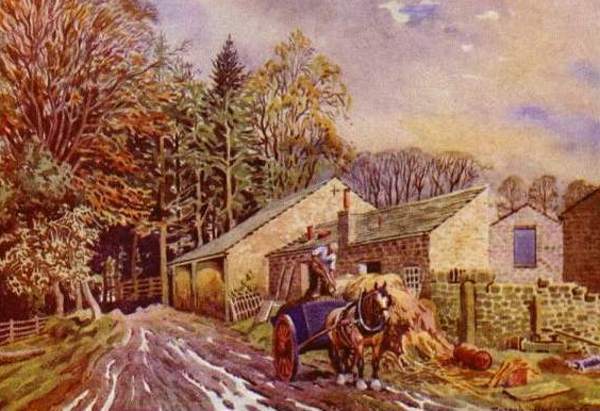 One bitterly cold January morning, Joe left Leeds to paint four hunting pictures, at which he must either stand or sit comparatively motionless outside for considerable periods of time. Arriving stiff and numb the conductor helped him with his sketching tackle and bade him a hearty good night as the door of the comfortable bus shut. 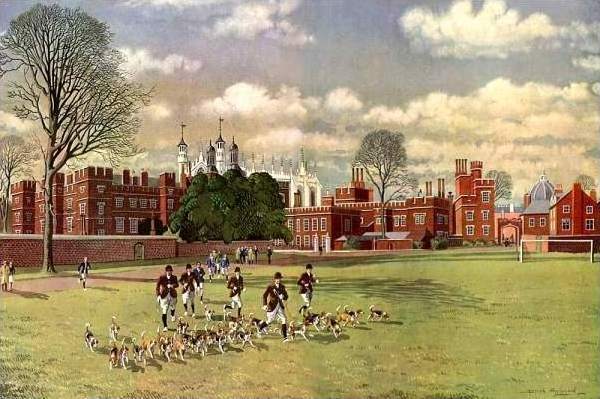 Next morning making his way to the kennels to see the pack as a whole, he asked if they would select their best ten to feature in the foreground of his painting. 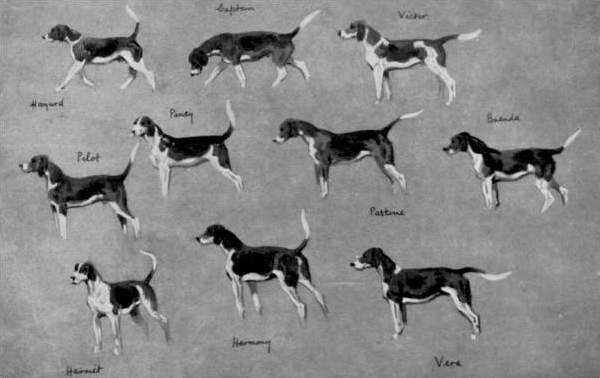 Being the most exacting part of his work, for they had to be true-to-life portraits, Joe would have the hounds brought in singly sketching in pencil, freely and quickly, with coaxing by their master to get them to stand in profile for the outlines to be finished. Watercolours then came into play, rapidly washing them in, starting with tan, then black and finally finishing with an opaque white. 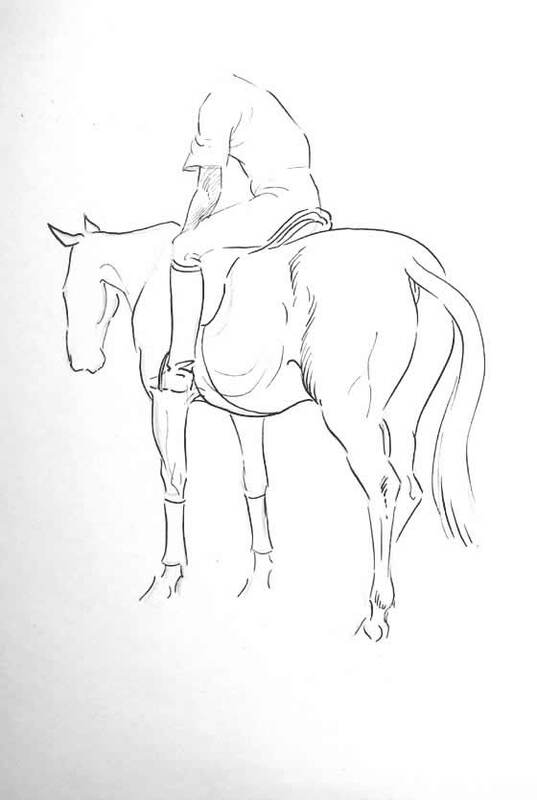 The next working drawings were of the master and his horse. 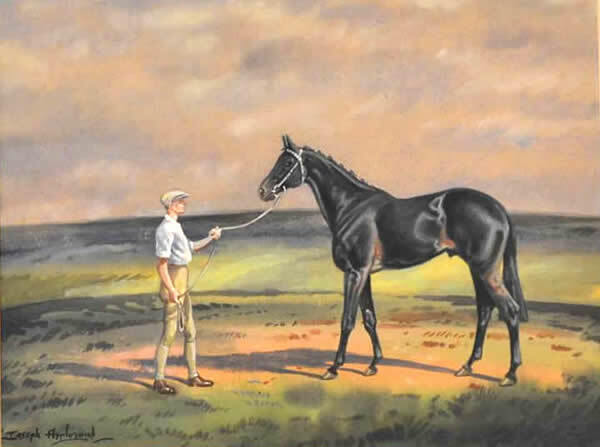 With the mare already saddled and bridled the Master posed, making sure that he was in a natural relaxed position and not sitting bolt upright and stiff which is unfortunately customary when a rider poses for either artist or photographer. 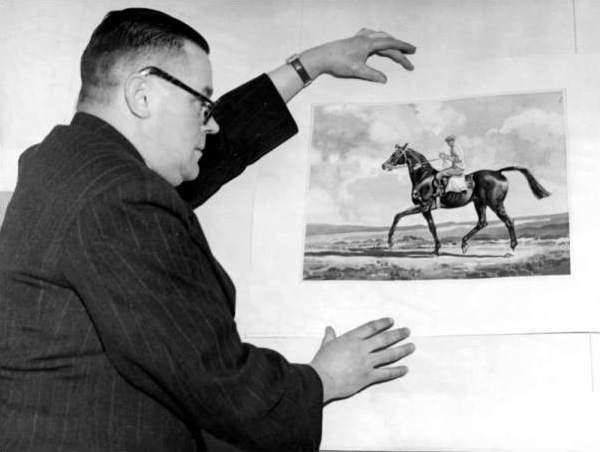 With another sheet of paper on the easel, Joe made a point of not being too near his models taking up position about four yards from the near side of the horse. Sketching the position and colour of the huntsman in pencil, to get something of the facial likeness was one of Joe's most difficult tasks, but having knowledge of the huntsman's character helped considerably. Watercolours then fleshed out the face with jacket, breeches, boots, cap and gloves finishing the study. 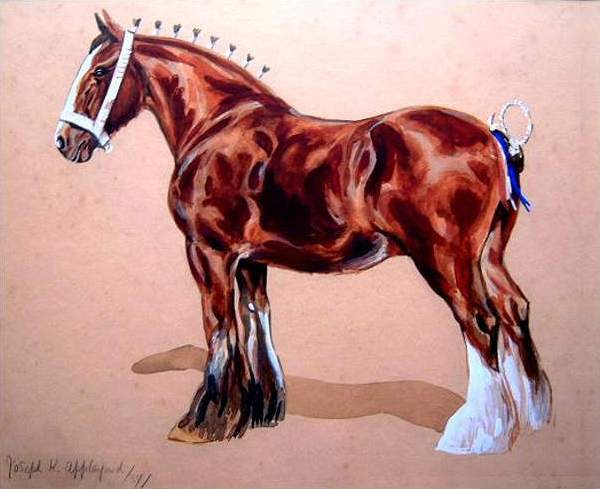 He noted the rider's tendency to lean forward or backward, how the cap sat, the way crop and reins were held, the position of the stirrup irons, the "swing" of the scarlet coat and the correct proportion of horse and rider. All details which the patron was bound to look for in the finished painting. 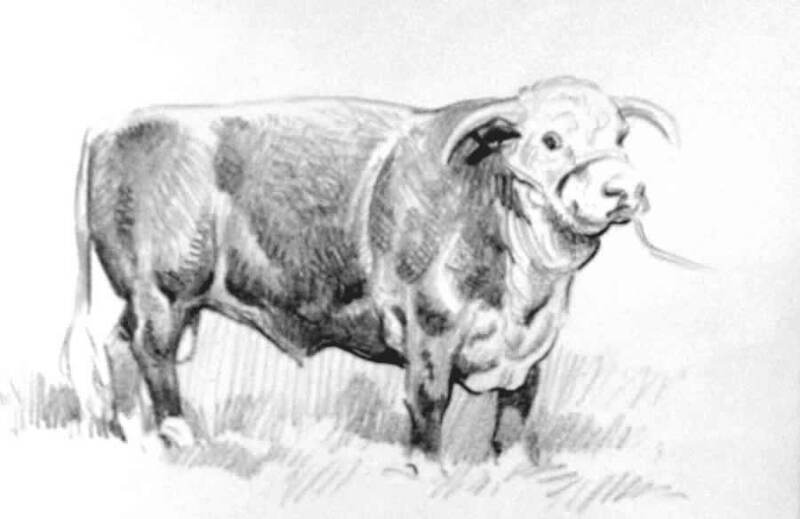 The Master resuming his normal duties, allowed Joe to concentrate on good pencil sketches of the head, bridle and close-up drawings of the body, legs, and tail, observing how the tail was "carried". With these indispensable drawings in the sketchbook and a fresh paper on the easel a careful colour study completed the day. With his portfolio and other belongings in his rucksack he returned to the hotel, to a cosy fire and a well-earned meal on the table. 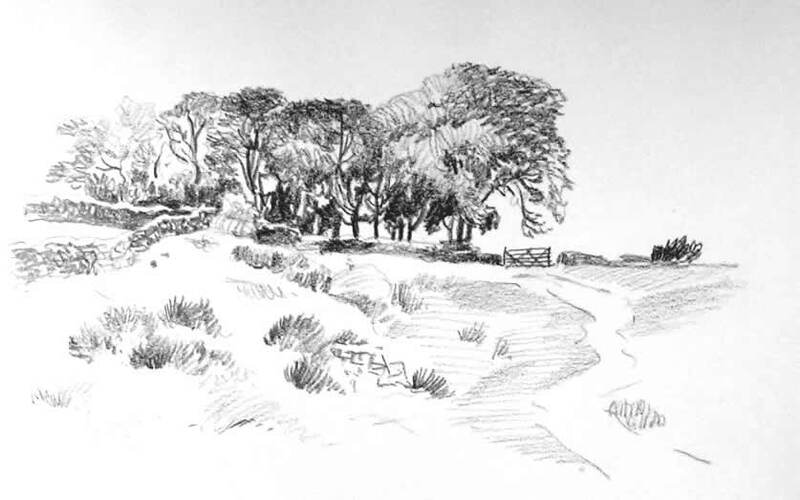 The next morning fortified with bacon and eggs Joe walked two miles to the commanding view which had been selected for him by the Master. 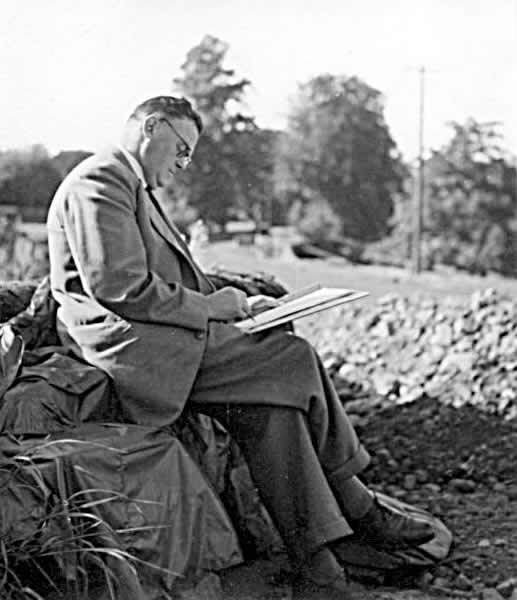 Here he sketched in watercolours before rewarding himself to paint and sketch at his leisure on the way back. 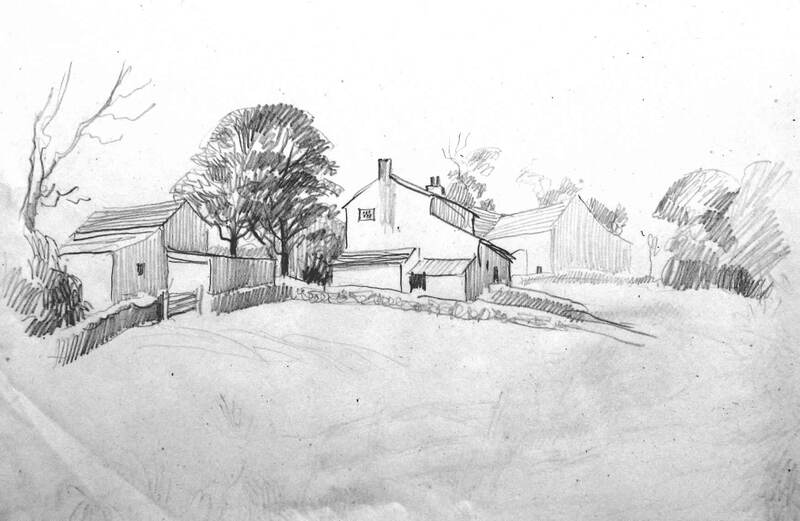 Back in his studio he sorted out the sketches into their respective batches and began his commissions in earnest. 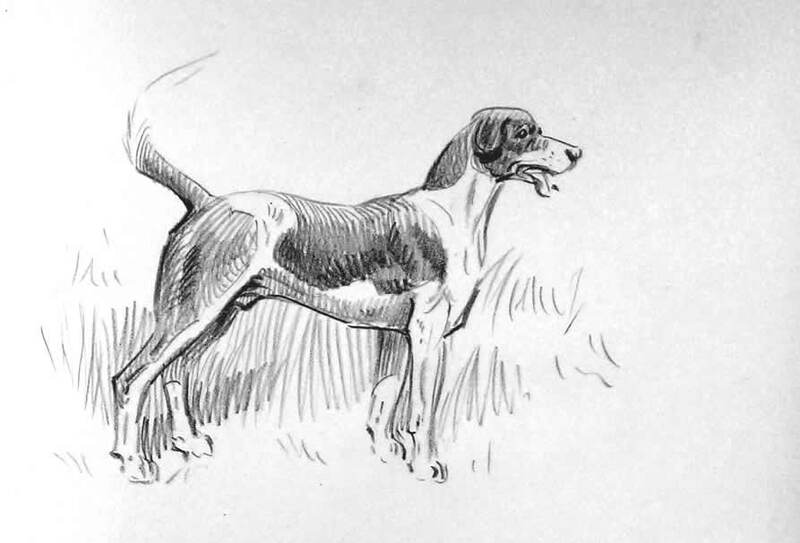 With the two hunting subjects completed, showing hounds in full cry and returning to kennel, his final studies for the hunter portraits were completed the following week. Joe never made a practice of using photographs in the execution of his paintings but did not see why they should not be utilised for detailed work or obtaining portraits of members of the field. At the races with his sketchbook, pen and pencil, he put down as much of the afternoon's activities as time allowed. Horses, owners, trainers and jockeys, in the paddock, the preliminary canter to the post, the start and finish of races, bookmakers and their stalls and the racing crowd in general. 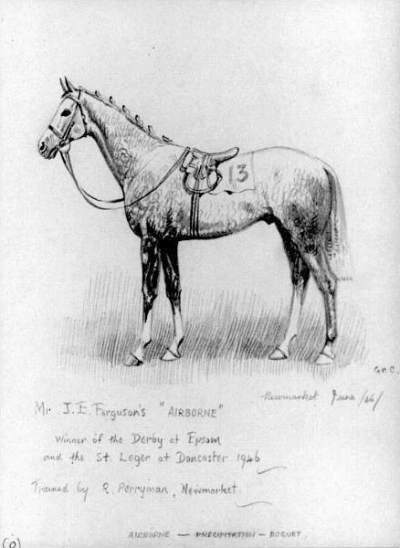 Starting gates, number boards, grand stands and other static subjects were accurately sketched at leisure on non-racing days. 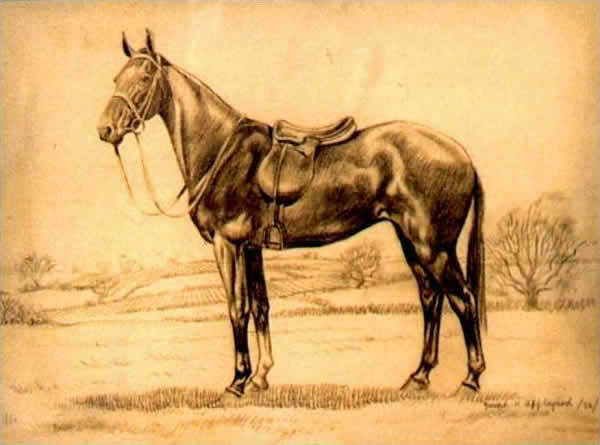 The method of making working drawings of horses, jockeys and trainers was on the same lines as those used for hunting scenes, taking into account that thoroughbred horses vary from the hunter. 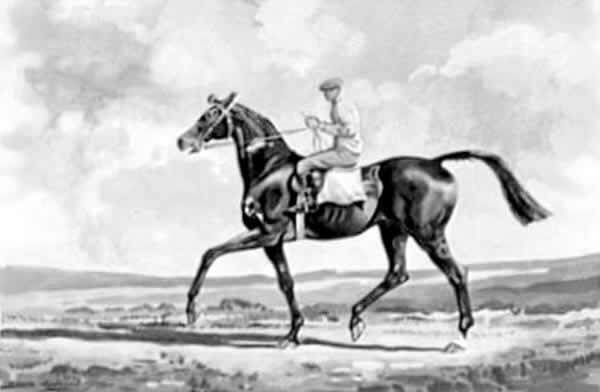 The jockey's seat in the saddle is much different from the hunting man. A day at a training establishment was most enjoyable for Joe. 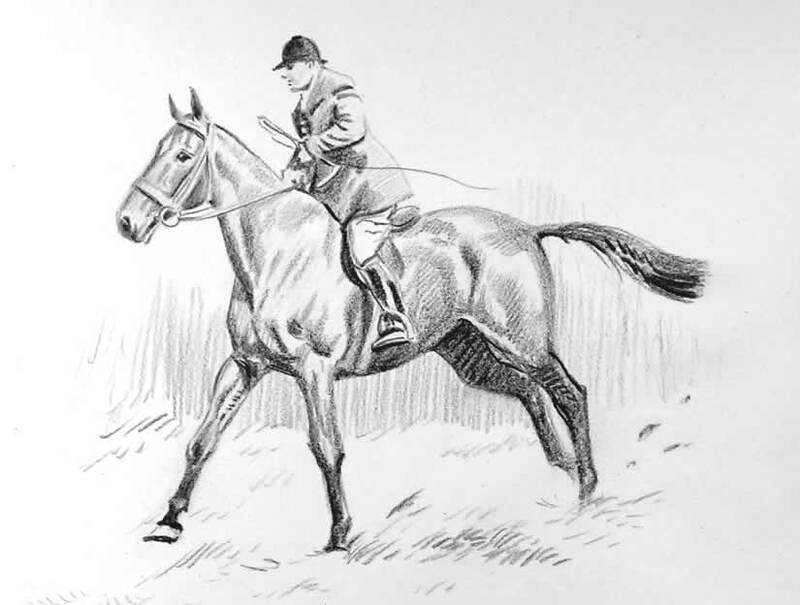 He did not thrust himself unduly onto the staff but sketched with all possible speed, as thoroughbreds are highly sensitive and prone to colds if stood too long. 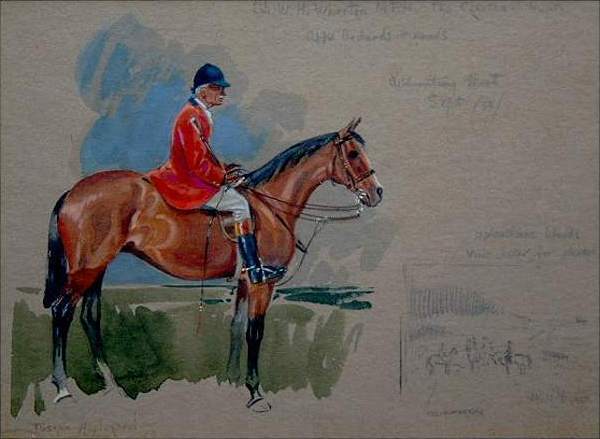 More careful studies in watercolour were done just inside the door of the horse's loose box where the mellow light of the stable interior was most effective. 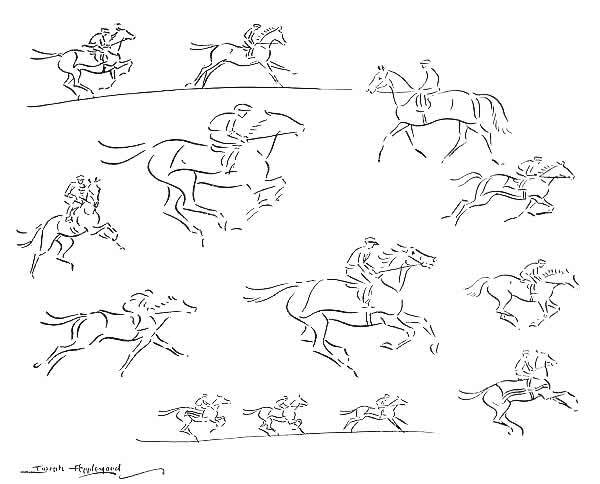 Early mornings saw Joe sketching horses galloping and exercising, particularly noting their movement with the merest of lines to reflect his excitement for the scene. 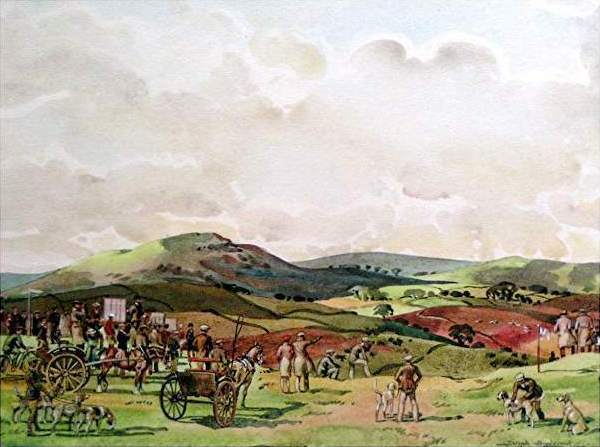 Cart Horse Parades and Agricultural Shows with decorative teams of horses and brightly painted carts were sufficient to urge Joe to get his paint box operating, working quickly whilst competitors awaited their turn for judging. These finished pictures would indeed put Joe on his mettle as he put down the onlookers as well as the gaily-decorated horses. 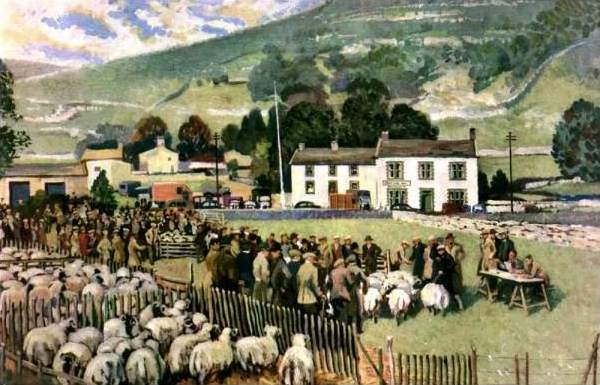 Given a good day's weather, Joe thought there was nothing more enjoyable than painting at an agricultural show, any activity that occurred in the numerous animal classes. Finally he would say, keep the sketchbook in operation at all times and be free and easy in the style of drawing and painting. 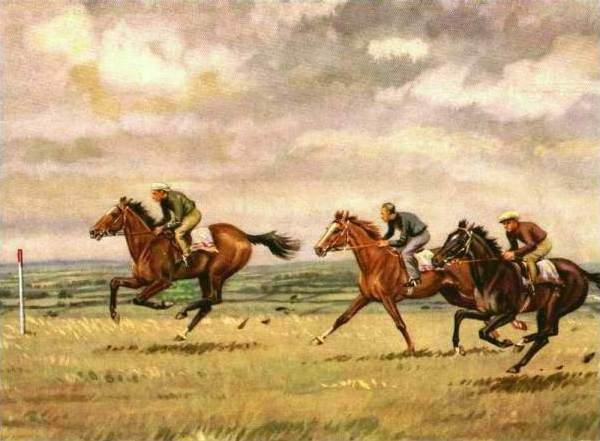 St Leger and racehorse portraits and studies are in a permanent collection at Doncaster Art Gallery. For permission to view telephone 01302 734293. 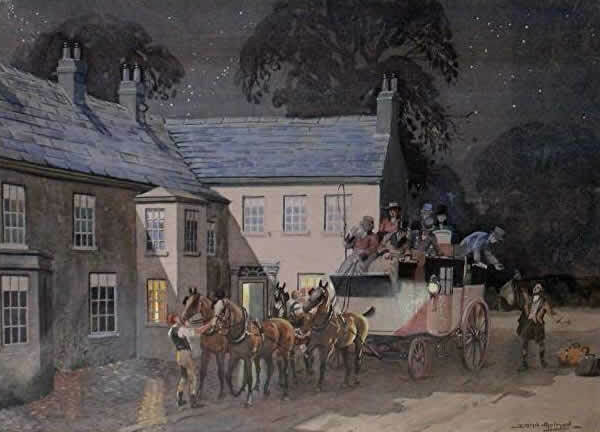 The Old Swan Hotel, Harrogate, has three large oil paintings on permanent display, now well restored to remove fifty years of nicotine. 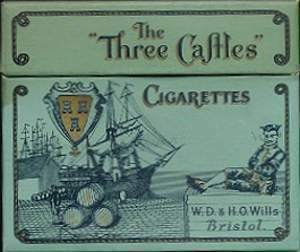 The nicotine would not have bothered Joe for he liked his Three Castles cigarettes and as his self-portrait shows political correctness was not an issue in those days! Some twelve years ago I tried to publish "Riding through the Ridings". My efforts were unsuccessful and the project lay dormant until 1999 when I decided to "publish" it on the Internet. 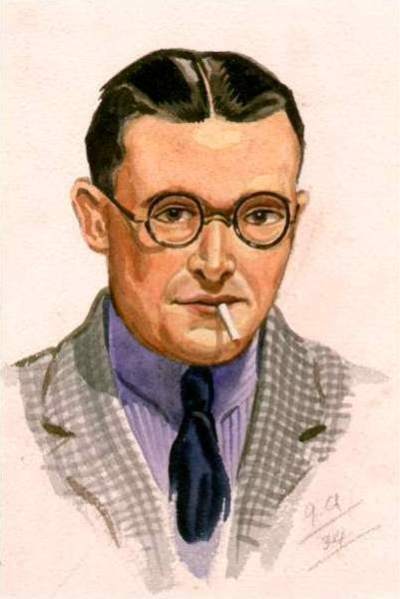 With access to Joe's remarkably good records the site was well established and has since grown and now showcases more than 400 examples of his work as my tribute to a wonderful father and talented artist. 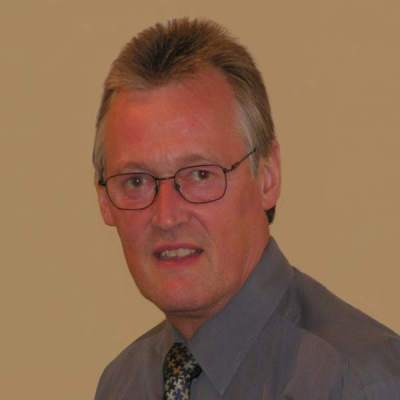 Joe's website is www.josephappleyard.co.uk or alternatively can be accessed by typing Joseph Appleyard into Google. hoping to exhibit on a regular basis.